My peanut butter cookie recipe hunt started with this amazing book , but I was really after a flourless version, which I found on Epicurious. The cookies turned out delicious and tender and were a hit with my little sister, who apparently did not like peanut butter. 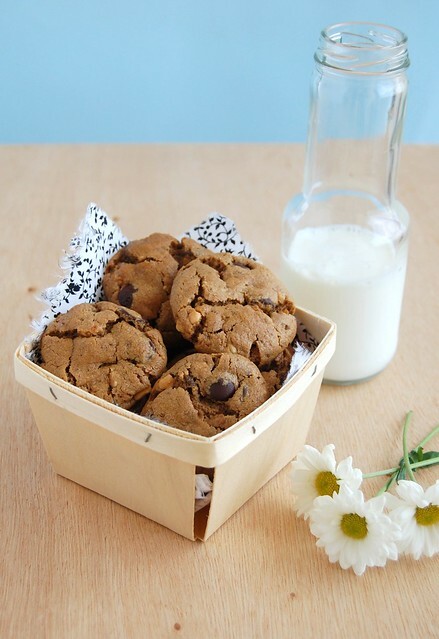 :) Just be careful when transporting the cookies, because the lack of flour makes them a bit fragile. Preheat oven to 180°C/350°F; line two baking sheets with baking paper. Mix first 5 ingredients in medium bowl. Mix in chocolate chips. Using moistened hands, form generous 1 tablespoon dough for each cookie into ball. Place onto prepared sheets, 5cm (2in) apart. Bake cookies until puffed, golden on bottom and still soft to touch in center, about 12 minutes. Cool on sheets over a wire rack for 5 minutes. Transfer to racks; cool completely. You seem to be able to read my mind :-) I am in a total peanut butter-mood at the moment. Definitely going to try this one! Greetings from Switzerland! Sounds rich and delicious and creamy! I haven't made peanut butter cookies in a long time and those are calling my name! iam new in baking world so need your advice. May i know what is 1 cup chunky peanut butter? I nominated you on the link you posted for the food blog awards! You deserve to win in every category in my opinion! These look amazing. Perfect for when I can't decide between cookies and candy! Now I can have them at the same time. Simply addictive and gorgeous cookies..
what do yu think would happen if i left out the egg? I wonder if these would be good with almond butter instead of peanut. The Jewish passover holiday is coming up and we don't use any flour. Peanuts are also off limits for many Jews during this week. I think I may give these a shot with some almond butter. Thanks! I am a complete baking novice, I had no idea that flourless cookies existed! How do they taste when compared to traditional ones? Peanut butter and chocolate is a great combination, the first time i tried it was in the US and i loved it! 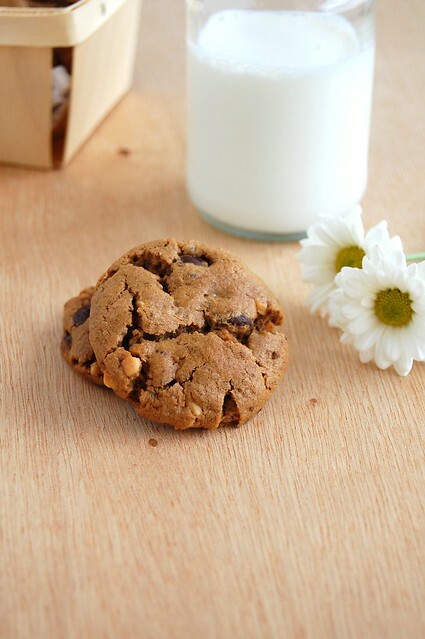 always looking for a good gluten free cookie recipe -- these look delicious! I have been craving peanut butter cookies in the worst way lately. Looks like I have the recipe to fix that now! I have included your amazing post in my favourites of the week, if you want to see it... http://blocderecetas.blogspot.com/2011/04/mis-favoritas-semana-14-2011.html, I hope you to like it! I'll take the whole batch please! gorgeous photos, Patricia! I love these cookies and with passover coming up these will be perfect for the cookie jar! This is just the type of cookie that, when I bake them, I end up eating half the batch before they're cooled! Katrin, thank you for stopping by! Sylvie, I hope you like these, sweetie! Nina, you're back, my dear! How great to see you around here again! Elaine, I do not know, sorry. Katie, thank you very much for your vote! :D You are very kind! Morgan, thank you for stopping by! His Khadijah, I don't think it would work out. Aleida, these are more tender and the peanut butter flavor is stronger. Valerie, they are great together, indeed! 44lalley, thank you for stopping by! Sarah, I hope you give these a go, they're great! Salome, thank you for letting me know! Min, I hope your friend likes the cookies! I tried these today. Amazing! I didn't think baking soda was needed with flourless baking? Did your rise much? Hey, Sinead, mine did not rise much.